Fit Foodie Megha: Yin Yang Food Festival - Balance of food and body : Baan Tao, Hyatt Pune — Reviewed! Yin Yang Food Festival - Balance of food and body : Baan Tao, Hyatt Pune — Reviewed! Hyatt Pune has come up with a very innovative concept of incorporating Yin-Yang forces into the dishes offered during the three-week long festival organised at Baan Tao. This is quite an interesting idea to look out for in the menu. The Yin Yang symbol encompasses harmony and balance within the universe. It can be with the food also as it has a sense of balance in color, flavor and textures. Some foods are believed to have Yin or cooling properties while others have warm, Yang properties. Chef explained how the cooking methods differs – Yin denotes boiling, poaching, braising and steaming; while Yang exists in deep-frying, roasting, grilling and stir-frying. We must consume a diet that has a healthy balance between the two. Challenging, isn't it? 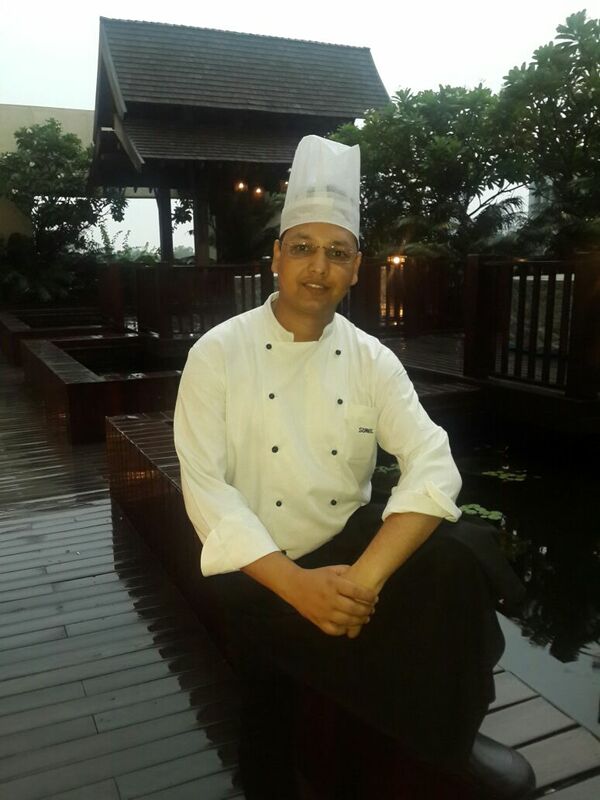 The Challenge is simplified by the Chef Sunil Joshi, who has brilliantly curated the Yin Yang set menu, categorized into three parts – Vegetarian, Non-Vegetarian and Sea Food. The set course veg menu was surely tempting – Two appetizers, a portion of salad, a soup, main course, dessert and tea to finish. Each single portion had the yin-yang element. As soon as we arrive, Yin and Yang inspired drinks are asked for. I opted for Yang Mary. Base of tomato juice, it had all the spicy, hot flavours especially cinnamon, and star anise. With first sip, I could feel the warmth of it pouring in. Wasabi peas with Pumpkin crackers were presented as munchies. I must say crispy crackers are addictive and one can not even identify the taste of pumpkin, unless mentioned. Amuse bouche of the day was also served. I loved the thin transparent layer of rice paper and spinach filling to it. Evening started with the balance plate of appetizer – Green peas, Spinach, Tuffle Oil, Crystal Dumpling and Hatchew Latchew Tahu. Dumpling was perfectly shaped, steamed. It had baby spinach, fresh peas, truffle oil and potato starch. I did not much felt truffle oil, though the dumpling was delicious and went well the sauces. Recommended! Best part of the meal was Hatchew Latchew Tahu, fried silken tofu with black pepper, red chilli, scallion and pepper. It was so very silken, melt-in-mouth tofu and the taste, OMG! I never had such delectable tofu anywhere! It was tempting enough to attract carnivores...;-) A must try! Super Highly Recommended! After a filling plate of tofu, we needed something fresh and voila, Rojak Buah Salad was waiting for us. Presented very beautifully. Roundlets of malay fruits like grapes, guava, green apples, pineapple were pierced into wooden sticks and garnished with tangy tamarind chilli dressing. As I mentioned each element of the dish had balance. Recommended! Tom Kha Phak Soup was comforting and heavy with coconut milk, coriander roots, mushroom, carrot, zucchini, cauliflower, beans, lemongrass, Kafir lime, galangal to appetize. It was so heavy to have a main course. Highly Recommended! Nevertheless, the menu was too full of scrumptious dishes to try! I asked for small portion and they readily agreed. I must mention, the portions usually served are quite generous. Wok braised exotic vegetables like Kale, shitake, beans, carrot, zucchhini, mushroom, pok choy to name a few were perfectly braised to make it a healthy main course. Along with which Stir fried Udon Noodles were served to make it a complete filling meal. Udon Noodles were tossed with pokchoy, togarashi, fried tofu, peppers and onions and tasted amazing. Highly Recommended! Who can say no for dessert and that too with a beautiful plating. Chiffon cake with litchi ice-cream, chopped nuts with hot choco-syrup was pure indulgence. Cake was fried and crisp and paired well with the silky icecream. One must not miss this! Highly Recommended! Non-Veg menu had different dessert - Yoghurt with berries, which also was worth trying but the star was litchi icecream.